#EMRex Good ending to a great week – virtually speaking! Mickey Mouse continues to get a good name! 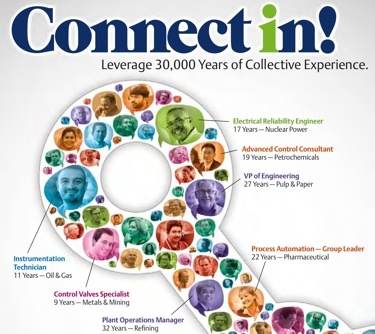 Download this 19-page post-evnt PDF report that provides in-depth coverage of Emerson’s recently held Global Users Exchange in Anaheim, CA USA. This time we had the added experience of actually attending the Emerson Global Users Exchange earlier in the year when it was held in Duesseldorf. 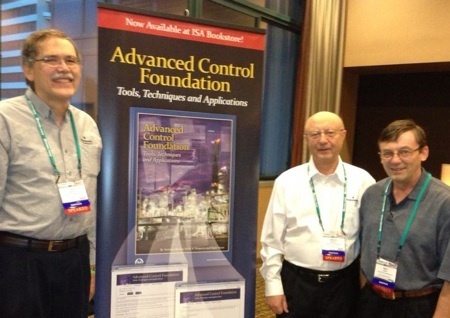 This event, described by us in Automation returns to Duesseldorf,” gave us some idea of the sensory experience of what is now almost universally known as #EMrex. Shake you head ang get rid of the image as Zornio gives “The big reveal! Going to be an exciting year. 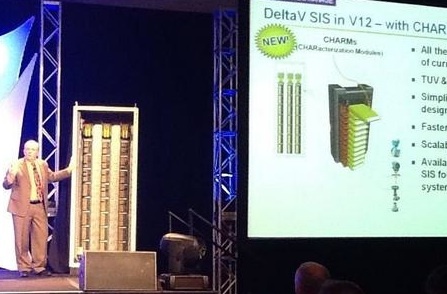 DeltaV SIS V12! New Safety Logic Solver with SIS CHARMS!” I guess it’s a continuation of their CHARM offensive! The tweets continue: “World’s first wireless on/off control valve can turn manual valve into an automated one monitored by WirelessHART.” and in passing he gives a statistic: “Emerson Smart Wireless reaches 1 billion hours. Smart Wireless applications cross one billion instrument-hours of operation.” These and other new developments are covered in the releases issue to co-incide with the event. One of the tweets mentioned a phrase I wasn’t familiar with (Probably had heard of it but I can’t remember everything) and quick as a flash (warptime?) Jim Cahill, who else, came back with a reference he’d posted in 2008! This shows the immediacy of social media, me in fairly remote Conamara on the western coast of Europe get an almost instantaneous response from the west coast of the Americas. Thanks Jim. Smart Wireless applications cross one billion instrument-hours of operation! Major expansion of Project Services. Also keep track of Jim Cahill’s Emerson Experts Blog. Expanding your professional network with other experts builds your personal expertise brand. Phone and email are transient. We lose this knowledge. By making things public, we create resources for others to find answers. The first thing companies do with new technology is ban it. Having one set of controls for both plants reduced control system hardware costs by 10%. Chad Sewell, Areva Resources Canada. Rosemount Tank Gauging radar level gauges protecting Manhattan from oil spill. User C Royston best presenter says lady in audience.Rob Bishop from Eastman, telling the benefits and reliability of wireless. Global users best presentation! Are the rooms small or the crowds large? Packed sessions w/ lots of interest, glad I got in early for prime seats! And lots lots more. This is just a limited selection of the miriad of tweets send during the week. I hope this helps to give a flavour of the wealth of information some serious, some trivial and some frustrating to this particulat sweet tooth (What I wouldn’t give for a taste of that Lemon Cake!). 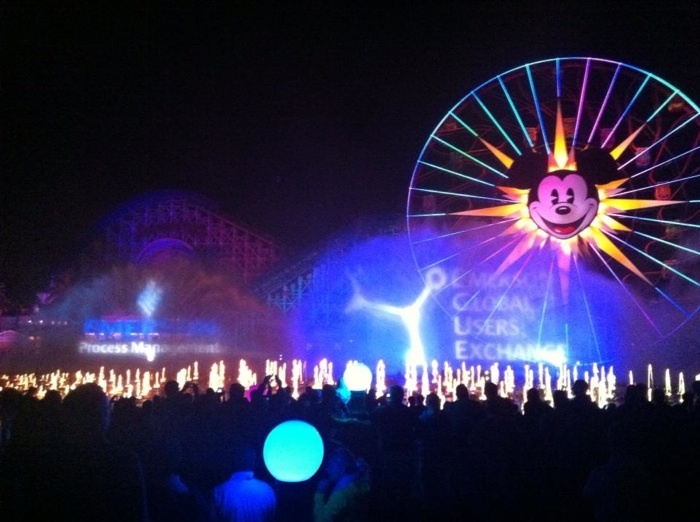 Anwhile in Anaheim, before the conclusion of #EMrex there was the visit to Disney Land. Mike Boudreaux produced the picture of the event below. Hmm! Maybe it was a Mickey Mouse affair after all! This entry was posted on Monday, October 15th, 2012 at 1:00 pm and is filed under Events, Uncategorized. You can follow any responses to this entry through the RSS 2.0 feed. You can leave a response, or trackback from your own site. One Response to #EMRex Good ending to a great week – virtually speaking!